Throughout history, alcohol has remained a popular substance in our society. From beer to wine, alcohol can be found in a number of beverages that many people consume on a daily basis. 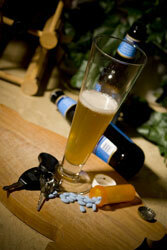 Given its popularity, it’s easy to forget that alcohol is a potent drug that can have very dangerous side effects. As such, the substance has become highly regulated, with federal and state lawmakers deciding who can use it, as well as when, where, and how it can be used. When it comes to age, 21 is the magic number, but when it comes to blood alcohol content (BAC), it’s 0.08% (unless you’re underage that is—and then you must abide by a separate underage blood alcohol content limit). Studies indicate that a person’s ability to drive becomes impaired once the amount of alcohol in his or her bloodstream reaches 0.08% or higher. Therefore, federal law recommends a 0.08% BAC limit, and although all 50 states enforce this limit, it only applies to drivers who have reached the legal drinking age of 21. It is ultimately up to each state to determine an appropriate blood alcohol content limit for drivers under 21. In most areas, an underage driver can be arrested for driving under the influence (DUI) if he or she has a BAC of 0.02% or higher. However, some states have enacted Zero Tolerance Laws, which make it illegal for underage drivers to operate a vehicle with any amount of alcohol in their bloodstream at all. In such areas, driving with a BAC above 0.00% is grounds for an underage DUI arrest. So just how can you determine a person's BAC? Chemical tests are the only reliable method to calculate this figure. During a chemical test, a driver's breath, blood, or urine will be analyzed to determine the percentage of alcohol contained in the sample. While breath tests—also known as breathalyzers—are the most common form of chemical testing, they are not always the most accurate. In fact, no chemical test is 100% reliable, as factors such as gender, weight, alcohol tolerance, in medical history, just to name a few, can affect a person's test results. As a result, it is always in your best interest to discuss your breathalyzer test results with an experienced DUI defense attorney immediately after your arrest. Remember, as an underage driver, you are expected to comply with a much lower BAC limit than drivers over 21, and it doesn't take much to be arrested for underage DUI. Unfortunately, should this happen, you may be charged with two separate offenses—one for driving under the influence and another for underage drinking.